This post shows you a dorm room tour. 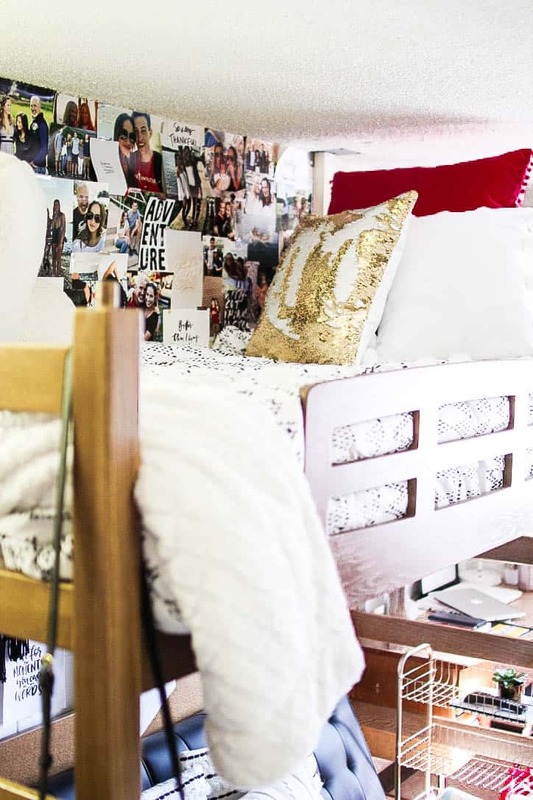 Are you looking to find inspiration for how to decorate your freshman year dorm room? It feels like just yesterday that I was obsessed with designing exactly how I wanted to organize my dorm room and the millions of trips I would take to Target and Home Goods making sure I have everything I could ever need. Not all girls are as crazy about having a Pinterest perfect dorm room but I will say that I think most want a cute dorm room that they can invite all their new friends too. 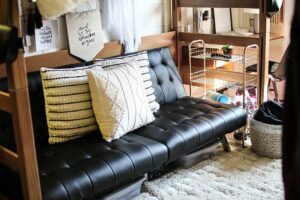 I was able to put together my dorm for a pretty reasonable cost and am going to show you exactly how I did it. I really do love how it turned out and it truly feels like a home away from home. Unfortunately (or fortunately), I was only here for one semester because I got an internship at Nate Berkus Associates and couldn't pass it down. Nonetheless, I loved this dorm while I was there! 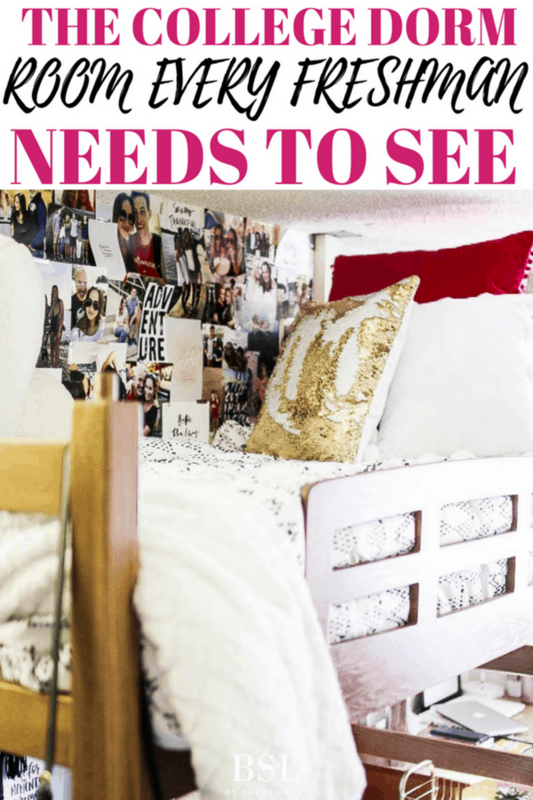 This post will give you a dorm room tour from my freshman year and show you how you can decorate yours to perfection. The bed is the heart of your dorm room and I wanted to make sure that is was just as much comfy as it was cute. My bed looked extra nice for this dorm room tour, but honestly, making it every morning started my day off on the right note and one of the biggest (realistic) tips I can give to freshman. I highly recommend before you even think about the different bedding, pillows, blankets, etc that you purchase an extra-long foam mattress topper. I promise you will easily think that was the best purchase you made for your dorm a few weeks into college! My bed at school is so much more comfortable at home. Here is the one I used and loved (it's also really cheap compared to other mattress toppers!). My bedding is from Target and was less than $20. Major win! Make sure when looking for bedding that you purchase extra-long versions! Otherwise, it won't cover the end of your bed. Unfortunately, my exact bedding isn't available anymore. Lastly, the wall behind my bed is filled with my favorite quotes and pictures. I printed out the photos from Walgreens in different sizes. I just taped them to the wall but towards the end of the semester, they started coming off. If you want a really secure hold, I would recommend you purchase command tape strips. My roommate and I choose to loft our beds due to our dorm room being extremely small (as I am sure a lot of yours is too!). Under my bed was the futon and under her bed was the TV, fridge, and microwave. This setup worked really well for us and was the standard way most students organized their dorm room at my school. I cannot recommend this futon enough!! It is really reasonably priced and for a futon, looks very nice. It was actually the nicest looking futon I've seen compared to other peoples. This futon is decently comfortable but nothing like you would get in a normal couch. I actually haven't ever sat in a comfy futon, so if you know of one, let me know ;). Here is the link to the futon I have. Once again, here is the link to the futon. In my dorm, the desk was attached to the wall so there was no moving it. It also came with shelves which I decided to style instead of use for storage. Whenever I did run out of space, I have to admit that I did put them on the shelves. Not as cute as before! I wanted the desk to be cute, but also extremely functional since I would be doing a lot of my school work there. I hate having stuff crowded around me when I work so I kept the actual desk decor to the back and very minimal. Unfortunately, I can't find exact links to the pieces but I have been able to find extremely close ones (that are actually better than mine since they are new and improved decorations!). Here is a similar lamp that you can find at Target (great price). The frames are all from HomeGoods...sorry!! Definitely, recommend going to HomeGoods, you will find amazing pieces for your dorm at a low price! Going down to a closet of this size was tough. Lucky, I figured it out and was able to fit all my clothes. I am not going to talk about my closet too much because I have a whole post on it HERE. I will mention that I highly recommend you use velvet hangers! It will save so much space. 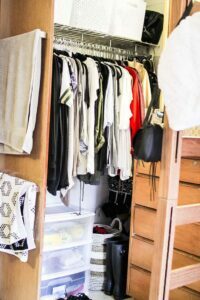 You can check out the post on my dorm room closet here. 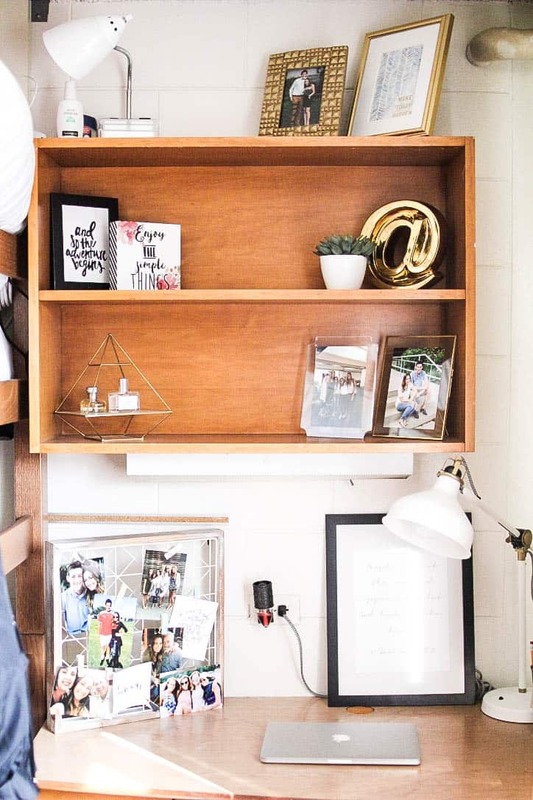 I hope this dorm tour gave you some inspiration on how you want to decorate your own dorm. 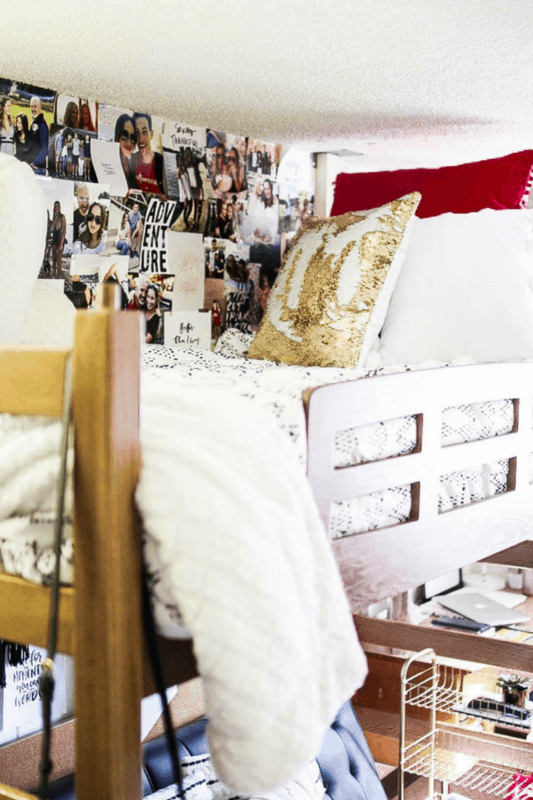 You will be moved into your dorm before you know it so enjoy these planning stages!! They are some of my favorite memories. love how you made so much out of a small space!